You guys have no idea how excited I am to be using a slightly different color scheme. I’m kind of tired of the crummy party lighting. Makes me subconsciously feel like it’s hard to see. Why why why does it stop here???? 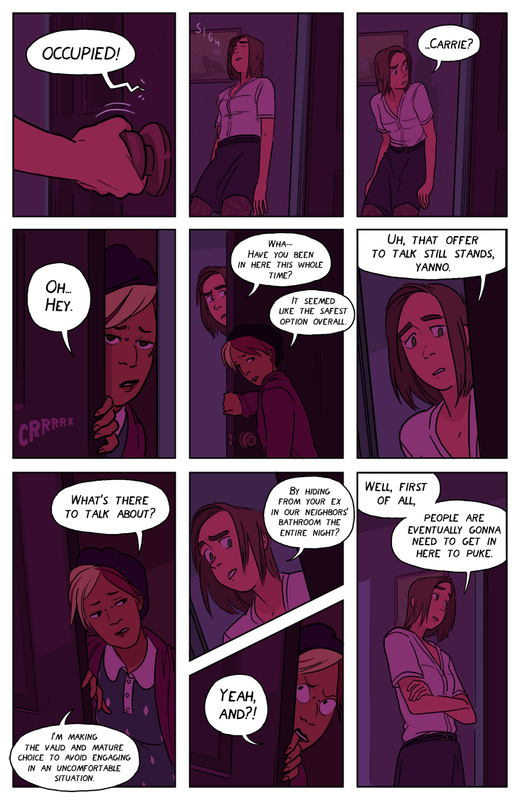 I read through all of this after seeing an Autostraddle article on the comic, and I have to say that I am digging it. Your character designs are so rad, and your dialogue is realistic. I’m looking forward to upcoming strips! Yargh now I’ve read from start in one sitting and gonna have to wait til Sunday! Loving it so far. Allison get to a hospital before your head explodes with blood! Glad that this is a gay comic, yes, good.